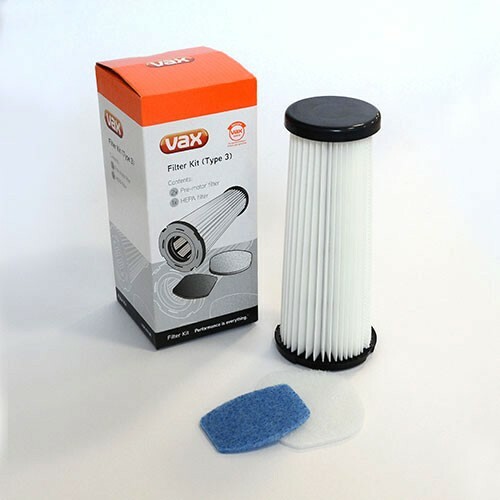 A replacement filter kit (Type 3) for your Vax upright vacuum cleaner, containing 1 x Pre-Motor filter, 1 x Post-Motor filter and 1 x central HEPA media filter that traps particles such as pollen, pet dander, dust mites and smoke. Suitable for Astrata, Power 3, Power 4, Powermax, Swift, Centrix, Performance, Turboforce, Everyday, Infinity, U87 and VS-19 uprights. Payment Plan of 4 x monthly instalments of £5.00 applies to Vax Filter Kit (Type 3) only, additional items to be paid in full at checkout.